module on Race and Representation in 20th American Culture when I stumbled across Lorna Dee Cervantes’ “Poem for the Young White Man Who Asked Me How I, an Intelligent, Well-Read Person Could Believe in a War Between the Races.” As I read this poem, my vision of America became undone and reconstituted with a more complex understanding of issues of race, gender, class and imperialism. The U.S.-Mexican border es una herida abierta [an open wound] where the Third World grates against the first and bleeds. And before a scab forms it hemorrhages again, the lifeblood of two worlds forming a third country – a border culture. Borders are set up to define places that are safe and unsafe, to distinguish us from them. A border is a dividing line, a narrow strip among a steep edge. A borderland is a vague and undetermined place created by the emotional residue of an unnatural boundary (25). and this is my land (36-37). And will be again (25). Again we see a tension between what was, what is and what should be, according to these two writers. In addition to this, both Cervantes and Anzaldúa’s quotes display some poetic techniques that appear to be deliberate to the subject matter at hand. For example, the line breaks in both poems express a resistance to imperialism and its resultant hegemony over Chicana/os in the U.S., while the irregular layout of Anzaldúa’s quote reflects on the complexity of the socio-political situation in the U.S.-Mexico Borderlands. In “Poem For the Young White Man” the phrase “my land” is given a line of its own, thus separating it from the negative “not” in the preceding line (36). So, the issue of ownership is highlighted and then reinforced by the line that follows: “and this is my land” (37). The “and” here links the two lines, while the repetition of “my land” as well as the internal rhyme with “and” strengthens Cervantes’ ideological hold over her own identity and position within the U.S. just as the final line of Anzaldúa’s quote denotes a positive movement towards indigenous autonomy of place and self. Given that poetry, to quote Scott Griffin, “is able to deliver, with just a few lines, the full range of human emotions,” I undertook doctoral research on the poetry of Lorna Dee Cervantes and Gloria Anzaldúa due to the elaborate interstices and overlaps of the emotional topography of the U.S.-Mexico borderlands that they construct through poetry. In return I have gained a (re)education in the history, politics, geography and literature of the Americas that in the words of Paul Jay have “multiple points of emergence that converge, clash, and reform themselves along the borders of various cultural zones” (182). Anzaldúa, Gloria. 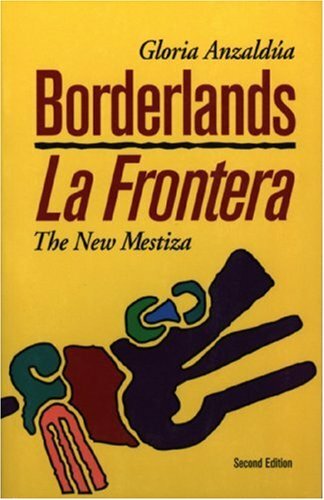 Borderlands/La Frontera: The New Mestiza. San Francisco: Aunt Lute, 2007. Print. Cervantes, Lorna Dee. Emplumada. Pittsburgh: U of Pittsburgh P, 1981. Print. Griffin, Scott. “Poetry: Why it is Important.” Youtube. Youtube. 5 March 2013. Web. 20 Sept. 2013. Jay, Paul. “The Myth of ‘America’ and the Politics of Location: Modernity Border Studies, and the Literature of the Americas.” Arizona Quarterly 54.2 (1998): 165-92. Print. Donna Maria Alexander is a doctoral candidate in the School of English and Department of Hispanic Studies, University College Cork. She is an Irish Research Council Government of Ireland Postgraduate Scholar. Her core research focuses on contemporary Chicana poetry. Her broader research interests include American literature, film and television, feminism, and geography. Before undertaking her doctoral studies in 2010, Donna completed a BA in English and Geography and a MA in American Literature and Film. She has articles published in FIAR and American Studies Today and blogs at Américas Studies. Her Twitter handle is @americasstudies. This entry was posted in Thesis Feature and tagged chicana, feminism, poetry on 09/10/2013 by pgcwwn.